Standing just to the north of the iconic XYZ Buildings in Midtown Manhattan, 1271 Avenue of the Americas, aka the Time-Life Building, is currently undergoing a major transformation of its exterior curtain wall, outdoor plaza, landmarked lobby space, and mechanical makeup of the elevators and MEP systems. 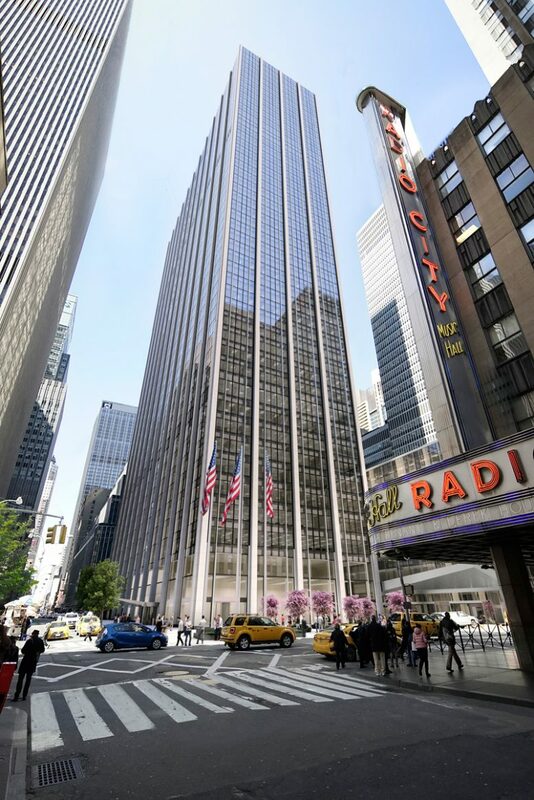 Built in 1958, Rockefeller Group Development Corporation is bringing the building into the twenty-first century by bringing on Pei Cobb Freed & Partners Architects LLP to helm the refurbishment of the 48-story office tower, which stands 587 feet to its rooftop. Looking from the street, the glass curtain is quickly closing in, and will soon once again fully seal the steel structure from the elements. It is being assembled simultaneously from the ground up, and from the top down. The columns of the new skin are brighter in appearance, while the glass uses low-E glazing with thermal breaks, providing more clarity and lower amounts of UV and heat penetration. The scale and proportions of the new facade are designed to closely resemble the original look of the building. Each newly installed curtain wall panel is about twelve feet tall between the floors. The only real difference in the new exterior will be the height of the windows, which vertically measure 87 inches, making them taller than the formerly 56 -inch tall windows. This allows additional daylight exposure while maintaining a subtle change in the outer appearance of the building that many may not even notice. 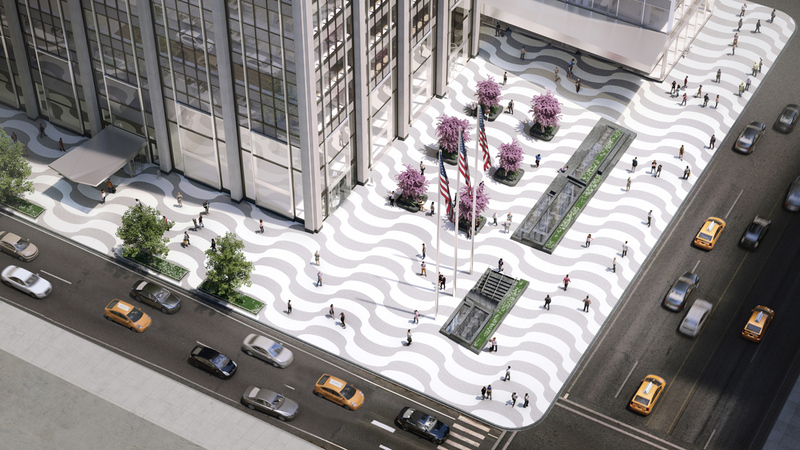 The future renovated plaza of 1271 Avenue of The Americas. Image by Rockefeller Group. On the ground floor, the outdoor plaza along Sixth Avenue is also progressing, and will have new eye-catching pavement, large tree planters, a large canopy above the entrance to the building along West 50th Street, and water fountains between the sidewalk and the plaza along 6th Avenue. The lobby floor also brings the signature paving pattern from the plaza, inspired by the sidewalk pavements along Copacabana Beach in Rio de Janeiro. 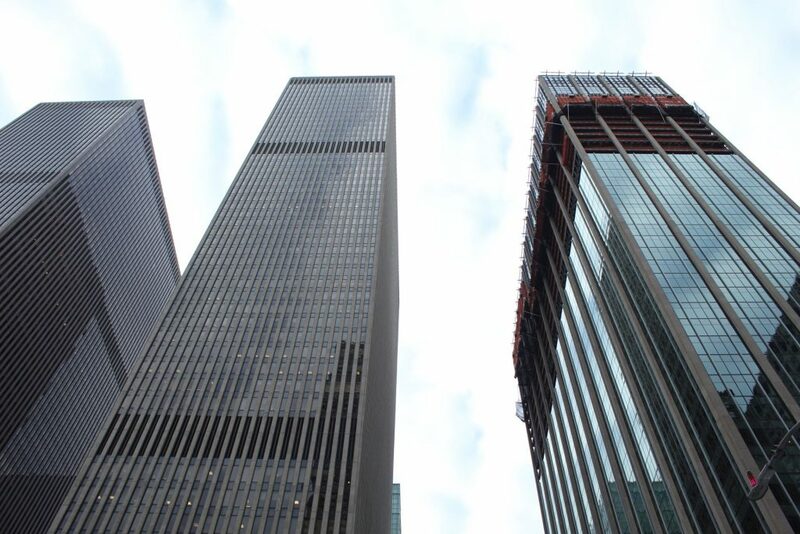 On 51st Street, a new metal canopy will be housed between the main tower and its smaller counterpart on the northeastern edge of the property. There will be retail and dining options, similar to the canopy between the Conrad Hotel and Goldman Sachs headquarters in Battery Park City, but on a much smaller human scale. 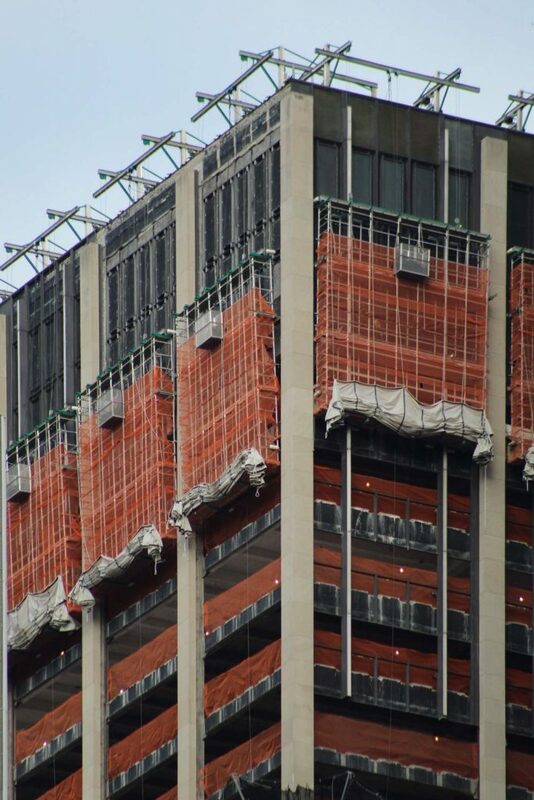 Completion of the new curtain wall at 1271 Avenue of The America looks to be expected sometime this winter. The project is also aiming for LEED Gold certification.